Jean-Michel Basquiat joined the 27 Club on August 12, 1988. He died young, at the height of his success, breaking through boundaries that had marginalised countless African-American artists their rightful place in museums, galleries, and history books. With the $110.5 million sale of his painting at auction earlier this year, Basquiat once again was established at the pinnacle of American art, with his work setting records and putting him in the company of Pablo Picasso and Francis Bacon. But who was the man behind the work, the Brooklyn native of Puerto Rican and Haitian lineage whose singular style set him apart and has influenced generations of artists worldwide since his death? As the Barbican opens Boom for Real – the first large-scale exhibition in the UK about the American artist – we speak with those who knew and worked with him over a period of ten years, to paint a portrait of the artist as a young man. Al Diaz is a first-generation New York City graffiti writer, who came up writing BOMB 1 before teaming up with Jean-Michel Basquiat to create SAMO©. From 1977 to 1979, they wrote pithy messages on city streets that stood out from the Wild Style tags that dominated the scene, with their easy to read block letter handstyle messages, which quickly captured the imagination of the art world and the media. Diaz remembers the early innocent years with Basquiat, running the streets as a teenager. “I met Jean through mutual friend, Peter Benedict. We used to pack into his room after classes, drink beer and smoke weed. I was like, 'What’s he doing up here?' I had seen Jean around school but I never really spoke to him. This was early in the fall of 76. We started talking and hit it off. I introduced him to graffiti with SAMO©. He did a drawing that was in one of our school newspapers. It’s really obvious that he was not a graffiti artist because he drew the sliding doors in a subway car and put his name in it: ‘Jean the Bohemian.’ That was his tag. (Laughs). Dude loved to laugh. Especially when he was younger. And then when he got strung out – I was strung out for a good 17 years so I know what that’s like – you forget to laugh. It will kill your soul and that’s the tragedy there. But Jean, when he was younger and more innocent, loved to laugh. Artist, filmmaker, and hip hop pioneer, Fab 5 Freddy (born Fred Brathwaite) hails from the Bedford-Stuyvesant section of Brooklyn. A seminal figure in the uptown and downtown scenes Fab painted Campbell’s Soup Cans on subway cars, was a regular on TV Party, starred in Wild Style, taught Debbie Harry how to rap, rhymed on “Change the Beat” (one of the most sampled songs in music history), and was the first VJ to host of Yo! MTV Raps. He looks back to some of the good times he shared with Basquiat. 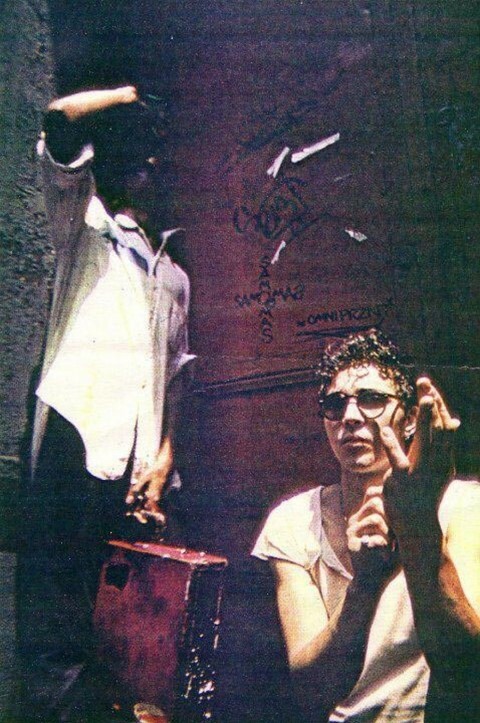 “We met in the fall of 1978 at a party on Canal Street given for myself and Lee Quinones. It was like our art world coming out party. Jean showed up and we all became friends. He was curious, smart, and focused on figuring the art world and pop culture out like I was. Andy was playing peacemaker as he knew there'd been tension between them, and Julian had never been to Jean’s studio. At the studio, Jean pulled out a dozen or more of his early masterpieces and drawings; at the time, early meant works that were five or six years old. Jean haphazardly scattered works on the floor for us to see. The thing was, Jean was walking in his shoes across the works, leaving fresh footprints on some and clearly didn’t care. A founding member of Collaborative Projects, Inc. (Colab), John Ahearn has been creating lifecast portraits of members of his local South Bronx community alongside his long-time collaborator Rigoberto Torres since the late 1970s. 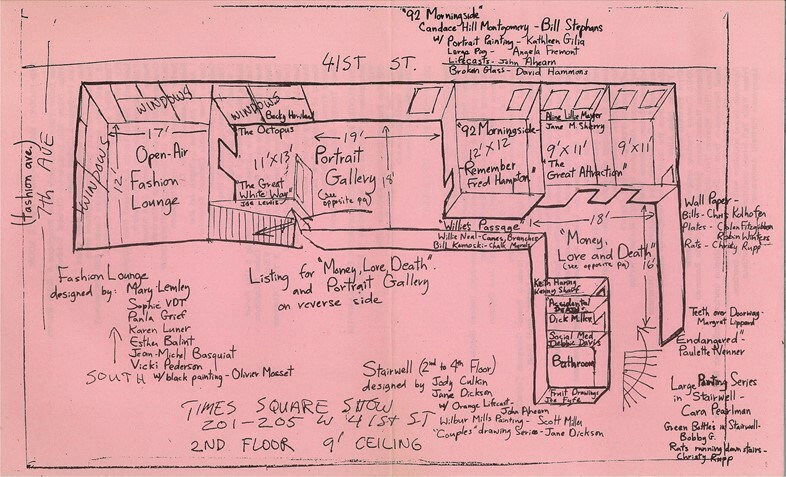 In June 1980, Ahearn co-organized the Times Square Show, a groundbreaking exhibition that was heralded as “The First Radical Art Show of the 80s” by The Village Voice. The show was staged on the corner of 41st Street and Seventh Avenue, inside a vacant building previously home to a massage parlor, back when Times Square was a delirious den of iniquity. The exhibition featured works by emerging artists including Keith Haring, Kenny Scharf, Jenny Holzer, Tom Otterness, Charlie Ahearn, Jane Dickson – and Jean-Michel Basquiat. Ahearn looks back at that pivotal moment of transformation in Basquiat’s career as an artist. “I think that it is fair to say that the Times Square Show was a moment for Jean-Michel when he was at the turning point from SAMO© to becoming the fine artist Jean-Michel Basquiat. From the first moment I met Jean-Michel, he was already on top. Jean-Michel had a painting in the Fashion Lounge on the second floor, an open-air situation where we took the windows out and had a balcony. He gravitated toward the Fashion Lounge because he liked the social scene back there – it was primarily beautiful young women. There were also SAMO© works in the show. There was a triangular shaped piece (like a pedestal) where information was given out, and he wrote on it. He also wrote SAMO© on the ceiling and the walls. I don’t see it as tagging. It was more like he put up an artwork like Jenny Holzer. He wasn’t trying to get up and be everywhere. He was making very mature, intelligent Beat poetry. Artist, film producer, fashion designer, and stylist Maripol is a force of nature. The French-born “It” Girl of the downtown scene first arrived in New York City in 1976 and quickly took the city by storm. Whether art directing for Fiorucci, styling for Madonna, Debbie Harry, and Grace Jones, or designing her own line of jewellery, Maripol defined the look of the times. 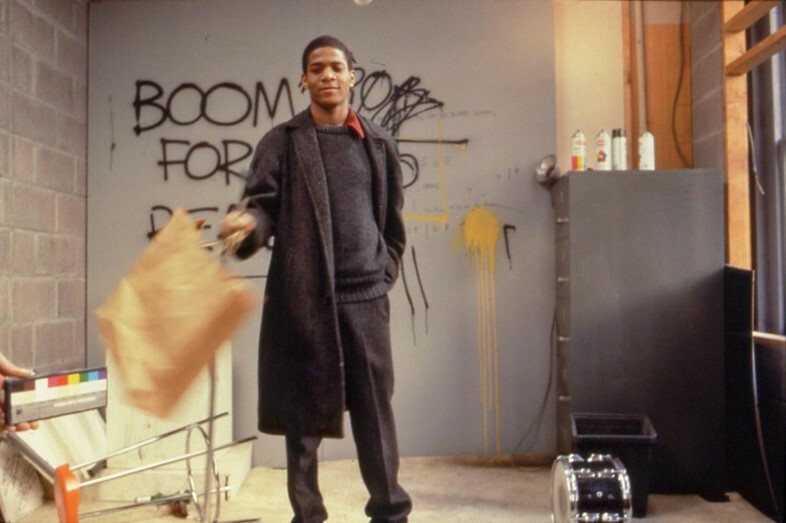 In 1980, she partnered with director Edo Bertoglio and writer Glenn O’Brien to produce Downtown 81, feature-length film starring Jean-Michel Basquiat, which was finally released in 2000. Maripol takes us back to that glorious moment in time. Edo had graduated from film school and I was saying, ‘We should do something about this.’ I wrote the first synopsis. It was the story of an artist going around New York and bringing you to the bands. Who was going to write the film but Glenn? He had the idea it should star Jean-Michel. He was very smart, very educated. I’m not saying he was easy, at all. I’ll tell you why. You are 19 years old. You are going to be 20 on the set. It’s 1981. It’s the coldest winter ever! It was between December and January. I don’t even remember Jesus being born that year because of the shooting schedule (Laughs). It was extremely cold and extreme conditions of Jean-Michel going out at night and having to get up in the mornings at six, to catch the light. We had rented on office on Great Jones, later he ended up living across the street – and that was my job, to get him up. We would start his makeup and hair. I had been the stylist and we had to double the outfit because of continuity. American artist, journalist, and archivist Marc H. Miller first arrived in New York in 1969, just as the downtown scene was taking shape with the fresh new energy of Do-It-Yourself. In 1981, he partnered with Paul Tschinkel for ART/new york, a series of video interviews with the top artists of the period. In November 1982, he interviewed Jean-Michel Basquiat to discuss his work in conjunction with an exhibition at the FUN Gallery, one of the leading East Village art galleries of the time. Miller reflects on dynamics he had with Basquiat, captured on video for the world to see. “Patti Astor encouraged us to tape the FUN Gallery show and to do an interview with Jean-Michel. We had previously taped the New York/New Wave an exhibition at P.S.1 curated by Diego Cortez and Jean-Michel had a big presence in that show. He knew the tape and had a sense of the kind of tapes that we made, which was very different from his other video experience, Glenn O’Brien’s TV Party, which was more of a free-for-all. We had a specific audience and a certain agenda. He was fully aware of that and happy to do it. We went over to his place on Crosby Street and did the interview. 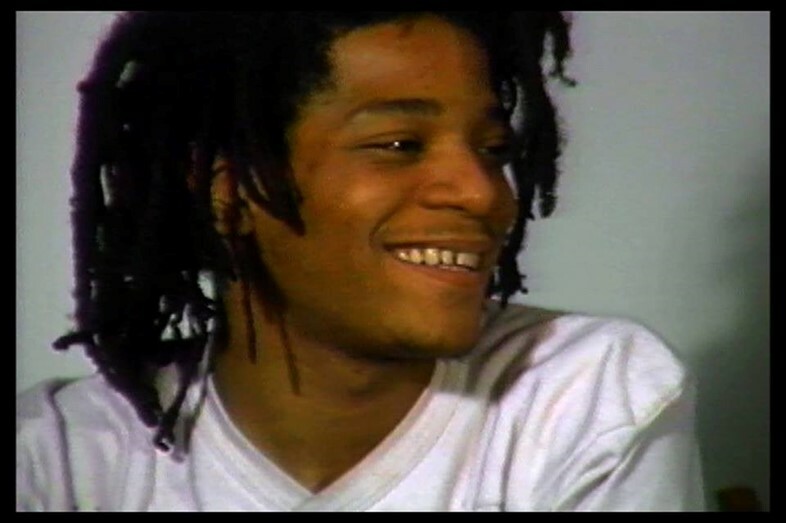 We’d be interviewing artists like Richard Serra and he’d go on and on but with Basquiat, his answers were very short. Any questions I went in there with were quickly used up. I tended in all the interviews to be a little bit confrontational or challenging, trying to get a lively little snippet for the tape. There was a bit of that element to the interview but he enjoyed it. He stuck with it for 40 minutes and it was back and forth. A lot of people say he played with me a lot in that interview. He was a 21-year-old kid; I was 36. He came in there and had prepared for it. He wouldn’t let anything go by. American photographer Christopher Makos apprenticed with Man Ray in Paris before arriving in New York during the mid-1970s and quickly became an integral part of Andy Warhol’s Factory. With the 1977 publication of White Trash, Makos made a name for himself as the first photographer to record the convergence of the uptown and downtown worlds. With his Interview magazine column “IN,” Makos photographed the crème de la crème of New York scene, from his sublime vantage point at the pinnacle of the top of the art world. He remembers the Factory during the Basquiat years. “The name of the place was ‘The Factory’ but there were four separate Factories. I was part of the last two Factories, from 1976-1986. The change happened after Valerie Solanas shot Andy Warhol (in 1968). After that, it became, for lack of a better word, more professional. Not anybody could come to the Factory anymore. You’d have to be vetted. This was a new era. Basquiat was a perfect match for Andy. He was on his own, he wasn’t part of the Factory, but he was very involved. Basquiat wasn’t a hanger-on type. He was very strong on his own. 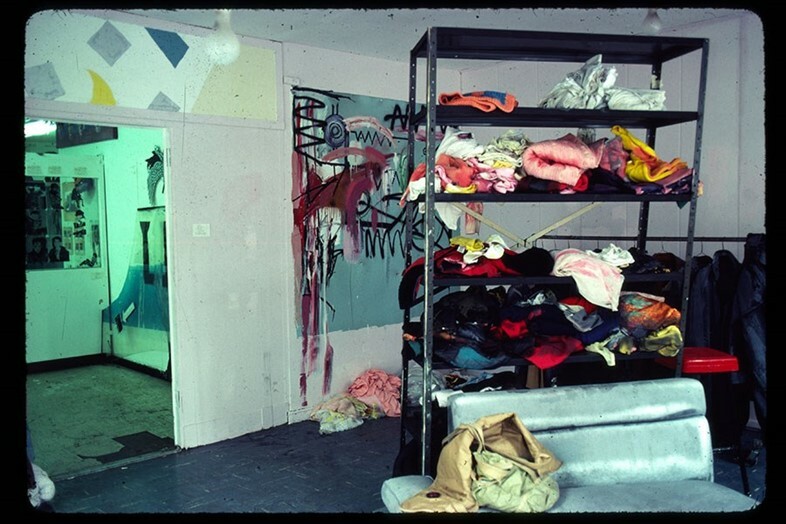 Andy rented Basquiat’s studio on the Lower East Side. He had bought that property and rented it to Basquiat. They didn’t hang out that much. It wasn’t a business deal but it was more like, “We could both get something out of this.” Andy would be associated with a new young artist and Basquiat would get the benefit of working with a major Pop artist like Warhol. Basquiat was a very interesting, soft-spoken, young African-American artist. 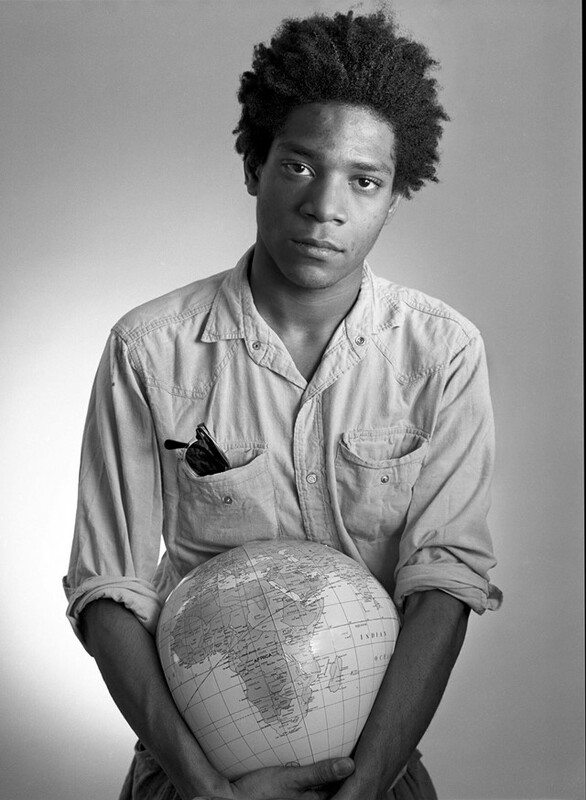 The picture that I have of Basquiat holding the globe: it’s no accident that he’s holding Africa in the picture because in many ways, he felt like he was the token black artist. He understood that he was the black artist that everybody wanted but he wasn’t sure if they wanted him or his work.